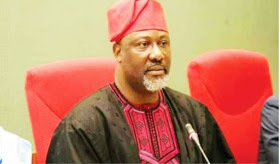 Dino Melaye, the embattled senator representing Kogi West at the National Assembly, on Wednesday, May 30, gave a hint of a defection from the ruling All Progressives Congress (APC) to the Peoples Democratic Party (PDP). Melaye, who is currently having a running battle with the police, gave the hint of his defection on the floor of the Senate. The hint came after the senator raised a point of order (14) at the sitting where he thanked his colleagues, members of the House of Representatives, his constituents and Nigerians for standing by him during his travails. Premium Times reports that Melaye then commended the leadership of the People’s Democratic Party (PDP) for their support as he asked Bukola Saraki to mandate the sergeant-at-arms to create a seat for him at the opposition wing of the chamber. He also announced he would now sit beside former Senate president, David Mark, pending the time a seat would be allocated to him.